We’d love your help. Let us know what’s wrong with this preview of Lost In Space by Joan D. Vinge. As Lost in Space, starring William Hurt and Gary Oldman, gets ready to blast off into movie blockbusterdom, Hugo Award-winning author Joan D. Vinge offer fans this action-packed audiobook based on the movie's exciting storyline. Capturing the Twists and Turns of Intergalactic fate, this exciting audio tells how the Robinsons came to be castaways -- the parents' plans for space travel and planet colonization, their children's mixed reactions to leaving Earth, and Dr. Smith's treachery that backfires when he's trapped aboard the lost ship. As their ship careens blindly through space, they encounter a mysterious, technologically advanced, but abandoned, space station, where the adventures escalate and their role in the fate of the entire universe becomes clear. To ask other readers questions about Lost In Space, please sign up. Regrettably, I'm writing this review after already watching the recent Lost in Space remake that came out not long ago and I know they are SIGNIFICANTLY different. But I will not be allowing myself to compare the two of them, because a review should not be about that. It should be about the content of the product you're reviewing. Now, the first thing I have to say... Is the ACTION! Wow, does this story get action packed into it, or what? The story starts off fast with Don West and Jeb (Jebediah) Regrettably, I'm writing this review after already watching the recent Lost in Space remake that came out not long ago and I know they are SIGNIFICANTLY different. But I will not be allowing myself to compare the two of them, because a review should not be about that. It should be about the content of the product you're reviewing. The story starts off fast with Don West and Jeb (Jebediah) 'last name' and then moves slowly while it focuses on the main characters' lives back on earth. Between the betrayal, action, horror, love, friendship, intelligence, and bonds, this story has everything a person could ask for. Witty banter, fun conversations, firefights, near-death experiences, original concepts, and even an alien planet. And if that wasn't enough... There's a really intriguing, thought-provoking concept of time travel that leaves you wanting to read on. Good novelization of a fun sci-fi flick from the late 90s. The story has the typical space opera cliches but goes down like cool Coca-Cola on a hot summer day. Smart science family travels hyperspeed to explore a distant planet for colonization. Lots of things go wrong during the journey, surprise surprise, featuring technospiders, evil scientist villains, and space portal phenomena. At around 200 pages, it's basically a novella that can be devoured in one read-through. I probably should rate thi Good novelization of a fun sci-fi flick from the late 90s. The story has the typical space opera cliches but goes down like cool Coca-Cola on a hot summer day. At around 200 pages, it's basically a novella that can be devoured in one read-through. I probably should rate this 3 stars but I have to admit, I BLASTED THROUGH THE BOOK and never wanted to put it down, which is a feat few books achieve nowadays. I wanted to re-read this book because there is tv-series in Netflix which is based on Lost in space movie (and book). 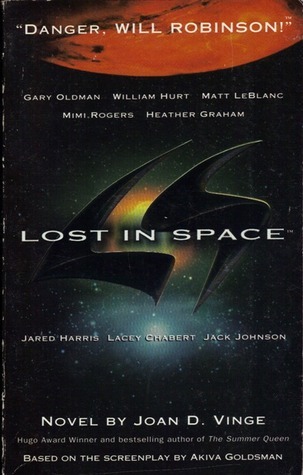 I have to say that this isn't well written book because Lost in space was movie first and then they made the book from the movie. I also didn't like "aliens" in this story because they were unbelievable and too creepy for me. I also rolled my eyes couple times to other things and I needed to remind myself that this was movie and that's why some things are over the top. Why do I st I wanted to re-read this book because there is tv-series in Netflix which is based on Lost in space movie (and book). I have to say that this isn't well written book because Lost in space was movie first and then they made the book from the movie. I also didn't like "aliens" in this story because they were unbelievable and too creepy for me. I also rolled my eyes couple times to other things and I needed to remind myself that this was movie and that's why some things are over the top. - all kinds of explosions ( planets, starships etc). Overall impression: it was like seeing a children's Sunday morning movie, nice, relaxing, engaging, pleasant. A novel based on the "Lost in Space" series from about 1965. The book appears to be written for younger readers. The Robinson family leave Earth in a space ship, intending to colonise a new planet. It's a 10-year flight whilst they are in a cryogenic hibernation state. The flight is sabotaged though and they end up getting lost, landing on a planet which is breaking up. A time warp on the planet leads them to see things they could never have believed, rewriting science as they knew it!! I read this book for nostalgia reasons. I love the cheesy movie, and I enjoyed the cheesy novel as well. 2 stars for quality. 5 stars for something that made me smile. I liked it, but I had already seen the movie so there weren't really any surprises. Joan D. Vinge (born Joan Carol Dennison) is an American science fiction author. She is known for such works as her Hugo Award-winning novel The Snow Queen and its sequels, her series about the telepath named Cat, and her Heaven's Chronicles books.